Recent studies have identified a possible link between heart rate variability (HRV) and diabetes or glucose intolerance. In other words, loss of autonomic function resulting in a reduction in HRV may also have negative effects on the body’s ability to process and store glucose. The first step to understanding this connection is to describe how the autonomic nervous system normally affects glucose balance in the body. 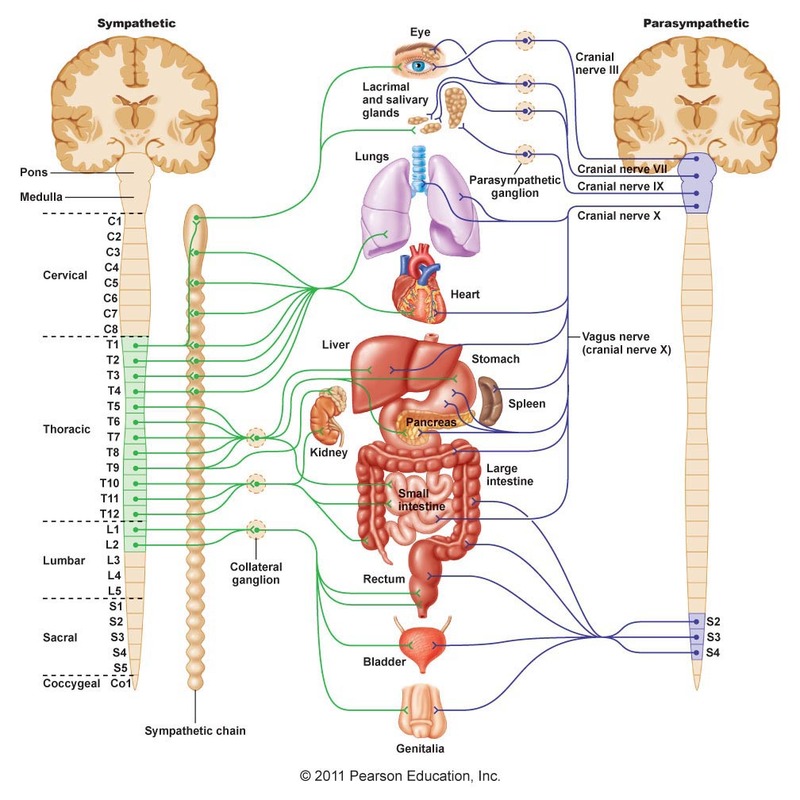 The diagram below outlines which organs are affected by the sympathetic (SNS) and parasympathetic (PSNS) nervous systems. In general, the SNS initiates a “fight or flight” response to stress. It increases heart rate, dilates or opens the lungs, inhibits digestion and dilates the pupils, providing the body with the resources it needs to protect itself in times of danger. The PSNS conversely, is known as the “rest and digest” system; it promotes digestion, reduces heart rate, increases salivation, increases urine secretion from the kidneys and constricts the pupils. On a day-to-day basis, these two pathways work in parallel to maintain homeostatic balance within the body. Glucose levels in the blood and tissues are maintained via a series of different processes, largely stimulated by different hormones. Ingested food is broken down by enzymes into simple sugars (monosaccharides), which are absorbed through the gut wall and transported to the liver. Glucose can directly enter the liver, brain, kidney and red blood cells. It uses insulin to enter muscle and adipose (fat) tissue cells. In the liver and muscle cells glucose is converted to glycogen, its storage form. The reverse process is the degradation of glycogen to form glucose and glucose-6-phostphate (G6P). In muscle, G6P is used to produce ATP, the unit of energy required for contraction. Glucose may also be used for the synthesis of other substances such as glycoproteins and glycolipids or it may be transformed into fat and stored as adipose tissue. All of these processes work together to maintain a normal range of blood glucose, from 3.8 to 6.1 mmol/L. The table below summarises the effects of different hormones on blood glucose levels. In healthy individuals, when blood glucose levels fall the SNS is activated, stimulating glucose production in the liver and kidney and reducing muscle use of glucose by way of adrenaline release. Vagal (parasympathetic) stimulation has the opposite effect: insulin release from the pancreas, which stimulates glucose uptake by cells; reduction in glucose release from tissues and increased glycogen formation by the liver. Hypoglycaemia, or low blood sugar, leads to sympathetic activation increasing blood glucose levels, while hyperglycaemia, high blood sugar, results in parasympathetic activation to reduce blood glucose levels. These two systems work in unison to maintain healthy blood glucose levels. Therefore, impaired parasympathetic regulation (decreased HRV) increases risk for chronic hyperglycaemia and hyperinsulinaemia (raised insulin levels, also known as insulin resistance), which is a pre-cursor for diabetes mellitus. Several studies have found a correlation between insulin resistance and HRV. 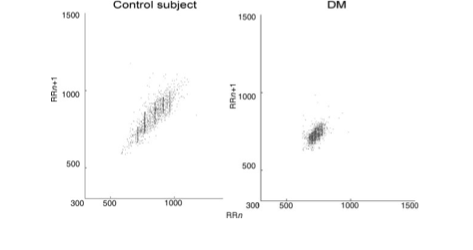 These Poincare plots compare a control subject to a subject with diabetes mellitus. In this small study (17 patients and similar controls), Javorka et al found that diabetic patients (DM) all showed lower than average HRV, demonstrated by the chart below. One of the biggest available population-based studies is the Atherosclerosis Risk in Communities (ARIC) study. In this study, the investigators found a significant difference between HRV levels, measured using high frequency (HF) power, in diabetic versus non-diabetic participants. They also found the HF varied by levels of fasting serum insulin in the non-diabetic population. HF was 1.34 bpm2 (beat per min) in the lowest quartile of serum insulin compared to 1.15 bpm2. The results of this study suggest that there is a correlation between insulin resistance (as indicated by raised fasting serum insulin levels) and reduced HRV. A 9-year follow-up analysis demonstrated an overall decline in HRV in both diabetic and non-diabetic populations, with a greater decrease in participants with diabetes. This finding is consistent with known increased risk among diabetics for autonomic neuropathies, which can lead to loss of sensation in the peripheries and in extreme cases, infected wounds resulting in limb loss (often known as diabetic foot). Several additional studies have shown similar correlations between HRV and insulin sensitivity, diabetes, fasting blood glucose and even glycosylated haemoglobin (HbA1c). While there is a vast amount of literature on disorders of glucose tolerance and HRV, there are still many gaps in our understanding of this relationship. It remains unclear for example, whether elevated levels of insulin or glucose reduce HRV or whether impaired vagal function is a causal risk factor for the development of diabetes. Studies of HRV in healthy individuals followed up for many years or genetic studies may help to clarify this correlation.